Home Film: Reel/Clips Writing Events/Performances About Contact Hey Haas! 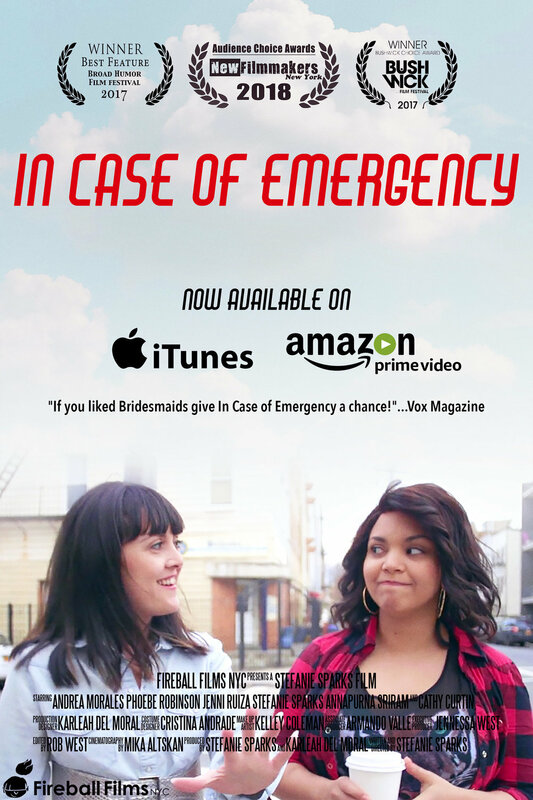 Director Stefanie Sparks' feature comedy IN CASE OF EMERGENCY is available on Amazon Prime! And, check out the review it received on Hammer to Nail! Summary of Film: Following an accident Sarah Williams, a New York City socialite, is forced to reevaluate her values in this darkly comic, low budget gem. Is Sarah ready to put away her judgements and pearls to descend into the subways of redemption? Or will she continue up the photoshopped elevator towards a lonely, bitter Park Avenue high rise? Laugh out loud with hints of gag-me gross & riot girl angst, director Stefanie Sparks’ edgy comedic genius grapples with what really matters in a world of selfish selfies: friends IRL. With appearances by Phoebe Robinson (YOU CAN’T TOUCH MY HAIR, 2 DOPE QUEENS), Cathy Curtin (ORANGE IS THE NEW BLACK) and other emerging female comediennes.